BTD-700 is a series of production-ready system-on-modules based on the Q7 standard (7cm square boards with 230-pin edge-connector) powered by 4th-generation Intel Atom E3800 “Bay Trail” processors – the first true SoC Atoms – including E3815, E3825/6/7, E3845, as well as the pin-compatible Celeron family devices, J1900, N2930 and N2807. Family devices include single, dual and quad core variants with a range of TDP extending from 5W-10W. Extended and industrial temperature variants are available. The BTD-700 series modules run Windows 7 or 8, and Windows Embedded Standard 7 and 8 Standard. 2GB or 4GB of onboard RAM is supplied as standard, and eMMC non-volatile, bootable storage is optionally available up to 16GB. 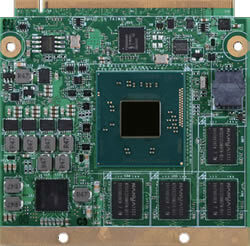 On module connectivity includes 3x PCIe, up to 8 USB 2.0 and 1 USB 3.0 ports, LVDS, HDMI, DP and DVI display support. Gigabit Ethernet is supported. A heatsink is required in normal fanless applications, and this may be supplied. A mini-ITX (170mm square) standard baseboard is available – QBX151, and provides a broad range of connectors, including SATA 3.0, PCIe x4, CANbus, I2C, LPC, GPIO, LVDS, DisplayPort and audio via a RealTek ALC886 controller We are able to assist customers wishing to incorporate a custom baseboard in their design. For development system and module availability, please contact our team. We look forward to providing you with knowledgeable, professional support to create your product. Please call Direct Insight on +44 1295 768800 9am to 5.30pm UK time, emailing info at directinsight.co.uk, or by using the “Contact Us” form below. Contact our experienced team with your detailed questions – we’ll be happy to help. Pricing information for spares and small quantities of modules appears on our online shop. However, for quantities of 50 and above, please contact us for the latest price information.